I love bars. They work great for feeding a crowd, are transportable and make the perfect dessert if you are in a hurry. After you mix them up there is not much to do other than pop them in the oven. No frosting, no dropping by tablespoons, no decorating. They are perfect as is, they only need to be cut. What is not to love? When I was again looking through the KitchenAid Recipe Collection I got the itch to make something. Yes, I browse through it often, like it is a bit of baker’s crack and I gotta get my fix. I just can’t help myself. This time I settled on the blondies. Mostly because I not only had all the ingredients but it seemed like a quick and easy dessert to make after a long day. They are perfect! 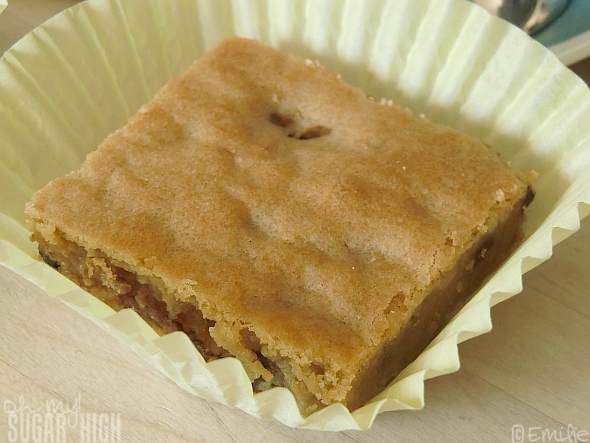 My favorite part of these blondies is the top of the bar which because it is made entirely of brown sugar versus white, the top has that slightly crunchy texture that is simply heavenly! They are perfect to pack and hold up well but are also simply scrumptious and oh so easy. Preheat your oven to 350 degrees. With flat beater, mix softened butter, brown sugar, eggs and vanilla and beat on medium for 1 minute. Scrape the sides of your bowl. Add flour, baking powder and salt. Mix for 15 seconds on low. Keep on low (I used the stir setting on my KitchenAid Artisan) and add nuts and chocolate chips. I actually used 1/2 cup of chocolate chips and 1/4 cup of nuts because, well, I couldn’t resist more chocolate. Mix just until the ingredients are combined. Grease and flour a 13″x9″ baking dish and press dough into pan. 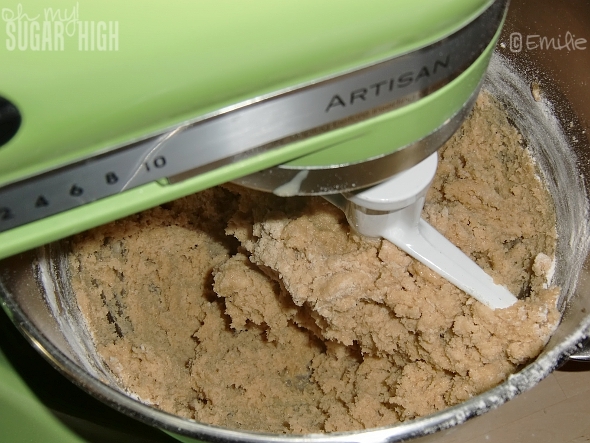 Keep in mind this dough is very sticky. I like to slightly butter my hands before pressing to keep it from sticking to my hands but you could also try wax paper to press it down. Bake for 20 to 25 minutes according to the recipe but I found I needed to go the full 25, even though in my oven I typically need to use the shortest baking time. Cool completely in pan. 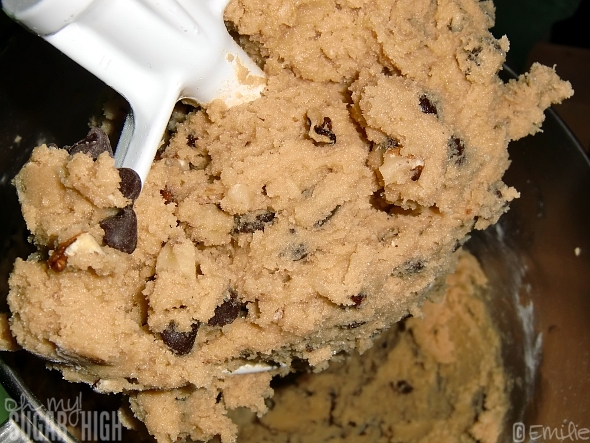 You will want it to cool entirely before cutting into these bars or much like chocolate chip cookies that are straight from the oven, the bar will seem a bit undercooked. We got a bit antsy because we wanted these for dessert and I cut them an hour after they came out of the oven. They tasted much better the next day once they really cooled completely and firmed up. The KitchenAid Recipe Collection has a retail price of $29.99 but is currently available at a discount on Amazon with free super saver shipping. Disclosure: I received a copy of this cookbook as a gift from KitchenAid but my thoughts and opinions remain 100% my own. Yours may differ. I love the KitchenAid Recipe Collections, it’s wonderful. 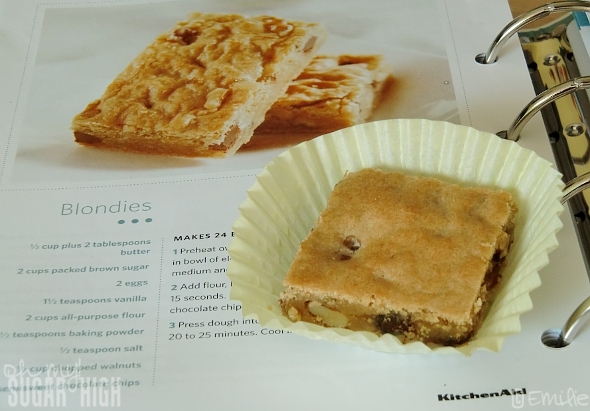 Your photos looks great and now I can’t wait to try this recipe too! The recipes I’m seeing from this cookbook look so good, I must get a copy! I wish I had a blondie (minus nuts) right now, Yummm! My hubby LOVES blondies! I may have to try this! I’ve never been good at making blondies but maybe I just need the right recipe! Okay thanks a lot, now I have to go buy chocolate chip cookies. These look delicious! I really need to get a mixer worth its salt. I love blondies. Never made them with chocolate chips though, fab idea! These would also be good with a maple glaze like they have at Applebee’s.